Last week we started to review the first four months of the 2016 season by looking at those who made the largest improvements in their overall performance versus the 2015 season. 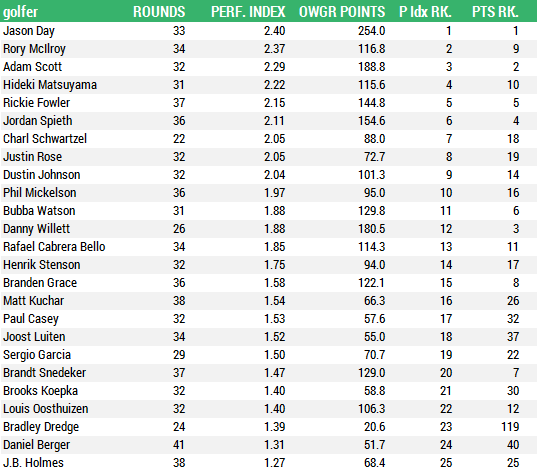 Today, we will look at who has played best – in terms of performance (measured by our Performance Index) and in terms of results (measured by World Ranking points). We’ll also highlight some golfers whose performances in 2016 have been undervalued by the World Rankings. I’ve included below a chart showing the top 25 golfers in the world in terms of the World Ranking points they’ve achieved so far in 2016. Next to that is the top 25 in the world as measured by 15th Club’s Performance Index. 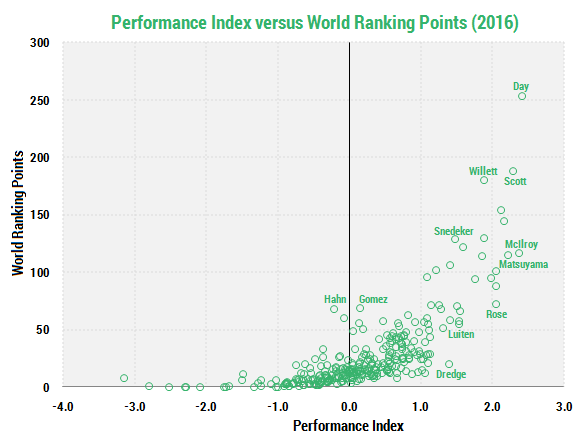 We’ve discussed the differences between World Ranking and Performance Index, but primarily the World Ranking attempts to measure accomplishment by mainly awarding most points to those who finish highest in an event, while Performance Index measures performance across all rounds and places each round in the context of the strength of the field, difficulty of the course, etc. 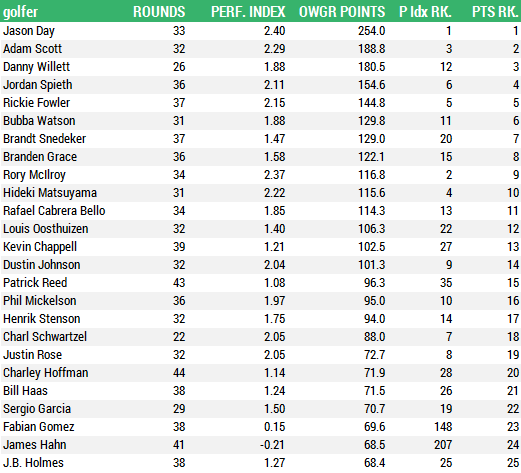 There’s a lot of overlap between the two lists – it doesn’t take an expert to know that guys like Adam Scott, Jason Day, and Danny Willett have played great golf this season no matter how you measure it. What’s more interesting is the guys who have been playing well, but not getting rewarded for that consistent high-level play. One clear example is Rory McIlroy. His season seems to be off to a sluggish start as he’s had inconsistent results and slipped out of contention on several big stages. But his numbers show his overall quality of golf to be very similar to past successful seasons. Above are the top 20 so far who have performed better than their points earned indicate. There are a number of reasons why these players have earned fewer points than their performance would otherwise indicate: 1) they’ve played more limited schedules because of injury or choice, 2) they’ve been more consistent without as many of the outlier performances that typically produce victories or missed cuts, 3) they’ve played in lower point awarding events. All things considered, if this group of twenty players continue to play at the level they’ve reached to start 2016, we expect the results (and points) to follow. To highlight the importance of looking at Performance Index when judging your start to the season, here are a few examples from last year of golfers who had the performance to start the year, but weren’t getting to results right away. Ben An began 2015 as a rookie having played well on the Challenge Tour in 2014. He kept that up to start the season (ranking 32nd best in the world in Performance Index at this point last year), but he only had a handful of top 10s to show for it. Of course, just weeks later he won at Wentworth in a dominant performance and has been one of the top European Tour golfers in the year since. 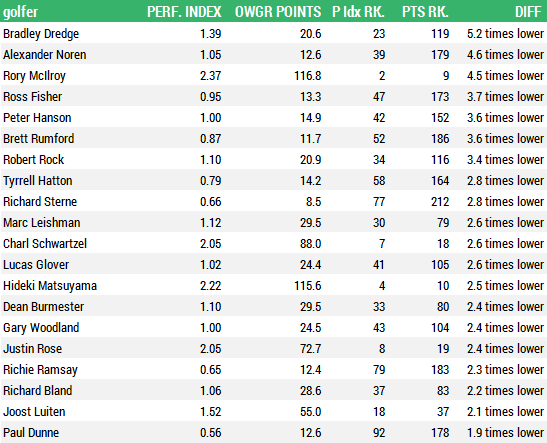 Shane Lowry ranked 57th best in Performance Index at this point in 2015, but only 119th in points earned. Lowry had played exceptional golf for about a year prior, but hadn’t achieved a break-through win. He went on to finish top 10 at Wentworth and the US Open, before a huge victory at the WGC Bridgestone propelled him to #19 in the Official World Golf Ranking. The point is that lacking a high finish or two or not racking up the ranking points doesn’t mean the start of the season hasn’t been a positive one. If you’ve showed strong performance and continue that solid play over the next eight months, the results will follow. The three players named above all had performances that were undervalued by the traditional metrics, but each saw a significant result later on in the season. When will you be updating this again?